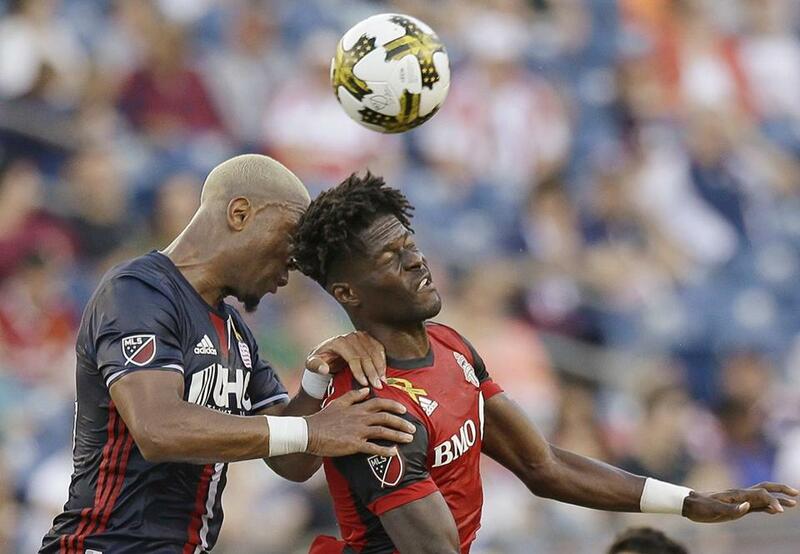 New England’s Claude Dielna (left) vies for a header with Toronto’s Tosaint Ricketts in last Saturday’s Revolution win. The Revolution have been tremendous at home this season, tying a franchise record with 11 victories. But as successful as they have been at Gillette Stadium, they have failed to approach that form on the road, going 0-12-3. The Revolution will be hoping the 16th time is the charm when they travel to Orlando Wednesday night, still in pursuit of a road victory. The Revolution pulled off one of the most stunning results of the season last Saturday, beating league-best Toronto, 2-1, in Foxborough. After 80 uneventful minutes, the match sprang to life in the final 10. The teams traded goals over a 120-second span before Kei Kamara headed home the winner in the 89th minute. “They’re a good team, and there were difficult moments in that game where we had to defend,” said Revolution interim coach Tom Soehn. “Those are the special moments, and on the road you’re going to see a lot more of those. While the Revolution enter Wednesday’s game following their third win of September, Orlando has gone just 1-7-3 since the start of July, with its only victory coming at D.C. United this month. The Lions suffered a devastating 3-0 loss at Portland Sunday night, their defense victimized by MLS leading scorer Diego Valeri as well as an impressive team goal touched in by Darren Mattocks. Orlando also had two defenders — Victor “PC” Giro and Jonathan Spector — sent off with red cards, and both will be unavailable Wednesday night. The Revolution and Lions met earlier this month in Foxborough, with New England cruising to a 4-0 victory. Kamara recorded his first career hat trick in that match, and the Revolution were aided by Orlando’s lack of discipline as defender Jose Aja was sent off in the second half. Despite Orlando’s lack of recent success, its attack remains one of the most potent in MLS, with Larin, Dom Dwyer, and Kaka patrolling up front. And the Revolution defense has been rocky on the road all year, giving up 38 goals in 15 games. Dan Shulman can be reached at dan.shulman@globe.com. Follow him on Twitter @GlobeDanShulman.